Posted on December 19, 2014 by Evan G.
The Boy in the Striped Pajamas is a book about a 9 year-old named Bruno, who is forced by his father, a commander in the German army, to move from his five story mansion in Berlin, to a house in the middle of nowhere called simply, “Out-with”. From there, Bruno slowly learns about what we now call the Holocaust. He can see the concentration camp in the far distance from his mundane bedroom window and his curiosity leads him directly to the center of the unfathomable. 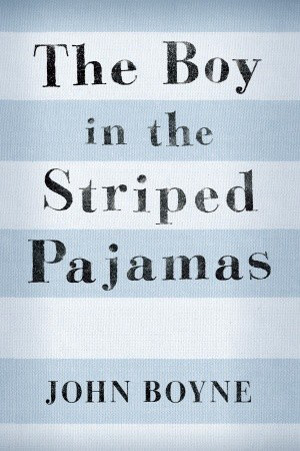 From wild adventures in a slave camp to a run in with an unstoppable tire swing, to his friendship with a mysterious boy in striped pajamas named Shmuel, this is a book that you won’t forget. I highly recommend this book to anyone who would like to learn history in a non-boring way. ⚠ THIS BOOK IS NOT FOR THE FAINT OF HEART ⚠ It has a very sad ending and contains very deep insight into life during one of histories most tragic times. I hope that you can pick it up at your local library or bookstore as this is a life-altering read. This entry was posted in Book Reviews and tagged historical fiction, john boyne by Evan G.. Bookmark the permalink.